With all of the recent activity, we hadn't taken an opportunity to introduce you to Cam's newest buddy, Kelsey. When a new school year begins, Jane begins the process of seeking out after-school care for Cam. A seemingly easy task except that it requires someone to work only 10-15 hours per week. The search this year was resolved by Cam's former teacher, Ms. Kathy, who recommended Kelsey to us....and we can't thank her enough. PT graduate school next spring, teaches swimming at the local YMCA and is beautiful inside and out! In the short time she's hung out with Cam, they've ventured to Baker Book House, the library, and Robinettes Apple Haus. We are blessed to have her in our lives and look forward to many Cam & Kelsey adventures!! 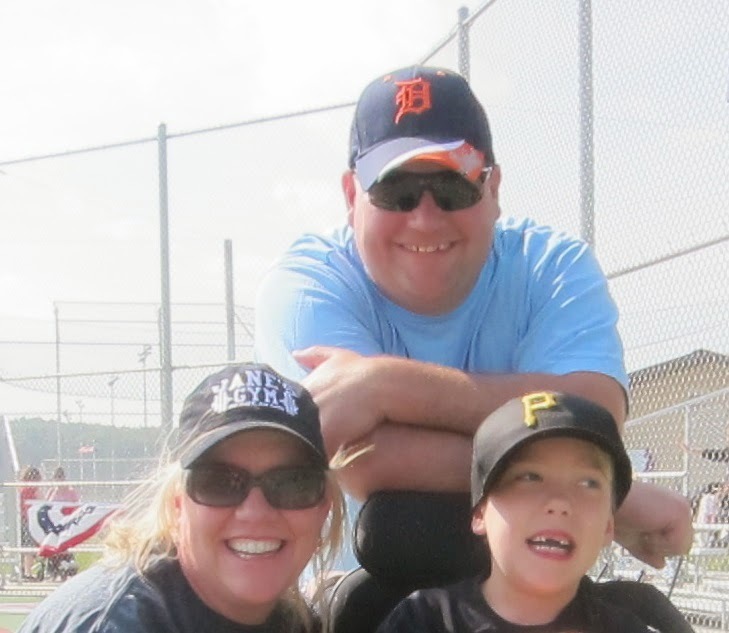 Cam rocked out another baseball game on Saturday at WMML. This week, volunteers from Home Depot took the field with the kids. We talked with Cam's helper, Sue, after the game and were surprised to learn that the volunteers were from 9 different Home Depot locations ranging from Ludington to south of Grand Rapids. Cam was not as interested in pics as he normally is since he was holding a rice krispie treat waiting to be eaten and was also told Home Depot was giving away ice cream which translated to "enough pics Mom & Dad!" On a side note, Stella the cat continues to make Cam laugh and he tells her on an almost daily basis that she is very silly! Cam decided we should post this picture to prove his statement! !